As I said on Twitter, it isn’t flip-flopping, but coping. No doubt many will be sniffing: a week’s break and you have to make a drama out of everything? You weren’t floored by last Friday’s news like we were, and at that time we really didn’t see any way forward with the blog when bad things were happening elsewhere. In the intervening week it has become abundantly clear, however, that there isn’t actually a lot that we can practically do at the moment; what’s happening is happening in another far-off country, and there is some room for hope (although such things are always relative). It is probable that there will have to be some travelling, and considerable handling of matters, and so it is more reliable to propose that TPL will in the course of all this be updated rather more fitfully than we would like. But, as I also said last week, this is by no means the end of the Then Play Long road. Indeed, both Lena and I have been very keen to find ways to keep it going, all of which culminated in a discussion last night which, in conjunction with the final record being played on a radio show (and which itself is the concluding track on entry #371), led or inspired us to want to continue taking the blog forward. I therefore present the piece which I had begun to write seven days ago before the bad news broke. Please note, however, that Lena will be writing the next two entries, both of which will be long-form and require considerable thought and application, given her first-hand experience of Britain in the summer of 1988. So the ensuing pause will probably be a lot longer, but absolutely worth the wait. It was advertised on television, and although I cannot find the ad in question online, you should take care not to be fooled. A very different proposition from the last CBS-dominant soul compilation album to make number one – what a difference a dozen years make – the target audience, at least in the UK, were young upwardly mobile couples, listening to Robbie Vincent or Tony Blackburn on the radio, and following the instructions to open the freezer door, light up the candles at the dinner table, and so on. 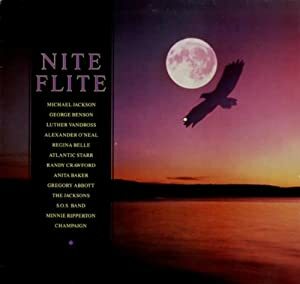 Given that CBS were also responsible for distributing the Def Jam catalogue at that time, you could also maintain that Nite Flite is defined by what it omits; one possible alternate title could be Don’t Worry, This Is Not Public Enemy. And I have to say that there are times, and indeed an initial impression, which suggest imminent immersion in Radio 2/Ford Cortina (or Mondeo)/furry dice/bedroom CD player in luxury Docklands apartment land. “Shiver” sees Benson taking his thing about as far as it could commercially go, while “Shake You Down” is utilitarian flatpack R&B, carefully designed to stimulate its intended target, although I cannot imagine that telling a woman that you want to shake her down, in 1986 let alone now, would not provoke a response involving a can of Mace (I think of its late 1986 chartmate “The Rain” by Oran “Juice” Jones, which latter, of course, does not make an appearance here). Atlantic Starr, represented here by two hits from two different albums, are much too smooth and untroubled for my palate (even though the lyric of “Secret Lovers” is deeply troubled). Nor does Regina Belle make much of an impression (it is not a Peter Frampton cover, and the parent album All By Myself was a minor hit here, but that was all). Meanwhile, “How ‘Bout Us,” though dating from 1981, was originally recorded by Champaign in 1975, and sounds it; the last dance before the disco is closed forever. The music included on the rest of the record, however, is music that is very close to my own heart, and moreover is music which goes some way towards subverting the picture of sham elegance which its packaging might suggest. I have always thought, for instance, that the unsullied glide of Anita Baker’s voice is a gift which would lend itself well, and maybe even startlingly, to unexpected other environments – I am very surprised that 4AD never enlisted her for any This Mortal Coil project – and “Sweet Love,” a song so strong that Courtney Pine covered it in the way Coltrane covered “My Favourite Things,” typifies the hurting elegance of Rapture, the NME critics’ choice for second-best album of 1986; a slow-motion study of a patiently blossoming passion which didn’t need to shout its truth at its listeners. “You Bring Me Joy,” “Caught Up In The Rapture,” “Same Ole Love,” and even the unjustly forgotten Rod Temperton ballad “Mystery” – all very fine (Janet’s Control, third in that same NME poll, could be said to act as a darker, dirtier, lustier flipside of the same coin). And this was also the time of Jam and Lewis, as producers and song constructors, represented here by three tracks; “If You Were Here Tonight” was actually written by the duo’s Time colleague Monte Moir, but O’Neal gives a splendid performance, the crux of which is his slowly ascending semitone in the second syllable of the second chorus’ “tonight” like a reluctant rebel stepping back from the gallows. But “Criticize” and “Weekend Girl” are superlative Jam and Lewis records, both of which interestingly turn on extended dialogues between lead and backing singers; the girls heard on the choruses of “Criticize” are arguing back with O’Neal’s disgruntlement, although the song’s deeper subtext – don’t you EVER call me a sellout, whitey – is as profound as ever (and I cannot think of another American pop song which uses the expression “fed up,” let alone mean it so pointedly as O’Neal does). The semi-random organ runs which decorate the multiple crescendi of “Weekend Girl” articulate the unspoken or unspeakable desire of the song’s subject. There was also “Almaz,” a late return to the charts for Randy Crawford; I first heard it on the radio in early 1987, laid up with ‘flu and surrounded by records of noisy, confrontational music, but still recognised it as a song of melancholy greatness. Not actually a song about her husband, “Almaz” is about an Ethiopian refugee couple, and their newborn child, who lived next door to the singer (who wrote both music and lyrics herself), and the attendant blend of fear and hope (minor-to-major and back again; “She’s young and tender/But will life bend her?”) arising from their situation. What the song suggests is, if you listen to it, quite radical. As, structurally speaking, was “Lovin’ You,” the oldest song here, the reluctant fourth single from 1974’s Perfect Angel, drawing a line between what came before (Rotary Connection) and what was to come a lifetime later (The Orb). A simple 1967-type song in many ways; producer Stevie Wonder liked the background birdsong so kept it going throughout the entire record, and there is little else save electric piano and a lost nightingale of a voice. Would such a record even have a sniff at the Top 100 now, let alone sprint to number two? And that’s saying nothing about the accidental poignancy of “Stay with we while we grow old” being sung by somebody who never got to grow old; mainly because it was a number two hit, and will therefore be covered more fully in the other place. No arguments either with Luther Vandross, albeit with two songs from two different albums (like Alexander O’Neal); Marcus Miller’s productions and arrangements are so skilfully deserted, like a sunny, newly depopulated island with a hidden landing strip, that they would have done the Miles of Tutu proud (although the cosmic sofa-surfing of 1985’s “The Other Side Of The World” remains Vandross’ great ballad performance). There will be plenty of chances to catch up with “Rock With You” later in TPL; for now, it’s enough to wonder just how perfect a pop record this is, insofar as there is nothing wrong with it at all, right down to the spaces and the “Popcorn” single-note keyboard solo and the chord changes. But Michael’s is just one of several voices – though one of the more prominent, there in the background – on the closing “One More Chance,” this record’s curveball and you might have to scratch your head a little to remember from which Jacksons album this came. Actually it comes from maybe the least heralded album of their career, 1984’s Victory, and is written and lead-sung by Randy Jackson. It is such a magnificent ballad performance that it shames the terrible singles that were taken from the record. He knows he’s been wrong, with her and with and to himself, and now he waits in limbo, pleading, his diminishing cries of “Say you love me…say you love me…I want you to say it…say it…” emanating from the bottom of an unreachable well. Marti Pellow is nowhere in the running. And so this “comforting” compilation ends on a discomforting note, the night now encroaching rather than enriching. Where the hell do we go from here?